Jeb Rand (Mitchum) is persued his entire life, first by the haunting mystery surrounding his family’s death and then by the hatred of Grant Callum (Jagger). While being raised by Callum’s sister-in-law, along with her kids, Thor (Wright) & Adam (Rodney), Jeb is haunted by nightmares of the night his family died. When he reaches adulthood he flips a coin with Adam to decide who will represent the Callum ranch in the war with Mexico. Jeb loses, but before he goes he admits his love for Thor and promises to marry her when he returns. When he returns a war hero long repressed resentment of Jeb by his bother Adam boils to the surface, they fight and Jeb leaves the family ranch, vowing to return to claim his things & take Thor with him. When Adam attempts to ambush Jeb, Adam is killed and Jeb is tried for murder, but acquitted for acting in self-defense. Ma Callum & Thor blame Jeb and vow to never speak to him again. When they see him at a town dance Jeb forces a dance with Thor & Grant Callum encourages her date to avenge her honor by killing Jeb. The young man fails & Jeb is forced to kill him, once again exonerated by self-defense. He begins to formally court Thor, who agrees to marry him, although her motives are muddled. When Grant Callum and his men come to kill Jeb he is forced to leave home pursued yet again until the final confrontation. 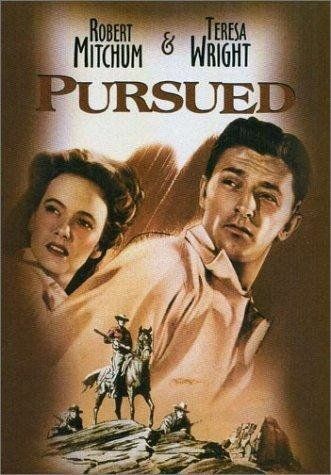 Often credited as the first Noir Western, Pursued is a wonderful mashup of 2 very distinct American movie genres. The open vistas of the Western are substituted with cramp interiors or shadowed landscapes. The codes of the west are twisted with psycho-sexual undertones and the conflicted nature of the hero belies the archetypal heroes of the classic westerns. While there is much that thematically undermines both genres, the visual style, beautifully captured by James Wong Howe (The Rose Tattoo ‘56, Hud ‘64, Body & Soul ;47), perfect reflects the noir sensibility, while the images themselves reflect all that the western allows. Howe moves his camera low, looking up at Mitchum with the destroyed, but jail-like remains of his family’s home above him. He captures shear rock walls behind lone riders, pinning them in and making them appear small, as if in the shadows of skyscrapers. He also consistently uses shadows to evoke a more claustrophobic environment, especially at night, when most of the outdoor activity occurs. 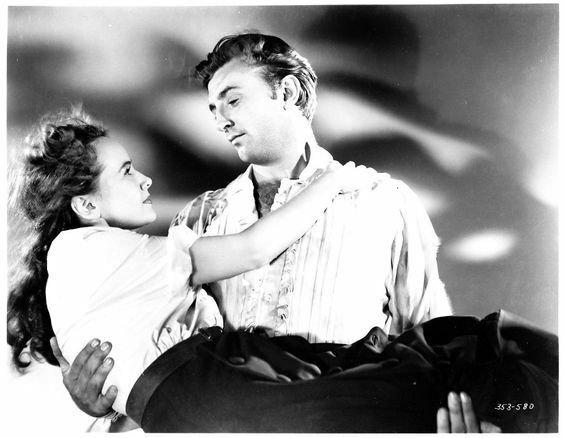 Mitchum’s character also struggles with the horror of his half remembered nightmare and finding a place in the Callum home. He struggles with his brother’s jealousy, feeling like an outsider, continuing to hold onto his name, even when offered to change it to Callum. It is only in his feelings for Thor, which he openly expresses before heading to war, that he is not conflicted. Although raised as brother & sister, the two cannot help but have feelings for each other. Before Allen is killed there doesn’t seem to be any question that their love is pure, but hat changes in the whispers & innuendo of the townsfolk when Jeb is courting Thor. While the characters may not overtly expression the twisted idea of a brother & sister becoming romantically involved, Thor’s desire for a ‘proper courting’ speaks to the idea that they know it’s not quite normal. Her admission, in fact, of going to her room at night and ‘thinking’ about Jeb, has all kinds of twisted overtones. Anderson’s Ma Callum is an interesting character, full of conflicted feelings and unresolved guilt. She remains the holder of secrets, often expressing the theme of the film “don’t ask questions of the past, It has no answers for you” as if begging the characters to forget. She wants to love Jeb, but it is a love born of guilt, with the words of Grant Callum echoing in her head, “what makes you think that boy loves YOU?” When she turns on Jeb when Adam dies it seems like her mixed emotions are tamped down in favor of a simmering hatred. Her better self has been defeated, the guilt has turned self-loathing and the physical manifestation is Jeb. Thor, on the other hand shifts from complete and consuming love to hatred instantaneously, blaming Jeb for the misfortune of her entire family. Wright’s manipulative character is fully exposed in her ‘formal courtship’ after Adam’s death, where Jeb at first isn’t quite sure where she is leading, but then sadly acquiesces to their combined fate. It’s a great performance by Wright because she performs innocence, cool calculation and cold blooded equally well. Pursued is at parts a warm family drama, with dark undertones to be sure, but it’s relentless nature and awesome sense of foreboding raises the stakes of even the most intimate moments. Grant Callum is the avenging angel of death, but director Walsh does enough with the small moments (the boys singing together, the repeated appearance of the coin) to illuminate the central Western motifs of honor, family & duty, while have the bad man dressed in black looming over them. The rich & complex morality at the center of the picture, however, utilizes the best of both genres and makes Pursued a fantastic example of both. Walsh, Howe, Mitchum & Wright are at the peak of their talents and combine to offer a memorable mashup of the highest order. *Screenwriter Niven Busch also helped write the screen play for the classic Noir The Postman Always Rings Twice (’46) & wrote the novel that Duel in the Sun (’46) was based on, both of which rely on Freudian undertones and highly charged sexuality. *The flashback nature of the storytelling is very common in Noir, as are the mostly nighttime settings and enclosed spaces. *Montgomery Clift & Kirk Douglass were both considered for the role of Jeb Rand, but Jack Warner thought Clift looked ridiculous as a cowboy & Douglass’ cleft chin was too great a distraction (Mitchum’s cleft was somehow deemed acceptable). *Director Raoul Walsh wore a black eye patch the result of losing an eye when a rabbit crashed through his windshield while he was driving to a desert location on an earlier picture. *Harry Carey, Jr., who went on to appear in more than 100 movies, made his ‘A’ level feature debut in Pursued as Thor’s doomed suitor. He & Mitchum got along so well that Mitchum had the young Carey, Jr drive him to the lot every day. Mitchum, at the time, had his driver’s license suspended.